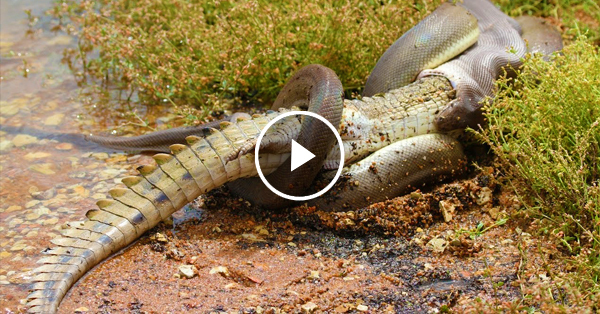 10-foot-python swallowed a huge crocodile! Unbelievable! Home / News / 10-foot-python swallowed a huge crocodile! Unbelievable! We've seen a lot of videos online that showed how a snake managed to claim another specie to be its meal. There was even an incident wherein an anaconda ate another snake, which caused both of their deaths. In this video, a 10-foot-python swallowed a crocodile in an Australian lake. A lot of people couldn't believe that this is real, but I assure you that this really happened. The whole scene was documented by the passerby who claim that this is indeed amazing! The whole battle lasted for 5 hours before the snake fully swallowed the crocodile. Some people claim that this is quite unusual because most of the time, snakes would prefer to eat prey that are smaller than them.